Lot happening on field ! Faf du Plessis, South Africa's stand-in captain, could be suspended for a Test match after being charged by the ICC over an alleged ball-tampering offence. Du Plessis has pleaded not guilty and is seeking legal advice to further contest the charge. A hearing before match referee Andy Pycroft will be held, but a date for the hearing has not yet been set by the ICC. The ICC confirmed in a statement that du Plessis had been charged for breaching Article 2.2.9 of the ICC Code of Conduct, which relates to "changing the condition of the ball". At Hagley Oval, Christchurch – in Test no. 2234, two players made their debut and did nothing on day 1 as it was washed out. One of them – tall, Richard Hadlee looks, a medium pace bowler who had left Zimbabwe for Auckland in 2006, before eventually finding his way into New Zealand's representative teams. He made his International debut in 2012, but had to wait another 4 years to play in a Test. The other debutant is an Indian, left-handed opener with strokes in most directions, Jeet Raval who is unbeaten on 55. It was the unheralded medium pacer Colin de Grandhomme who rewrote the New Zealand test record books with a spectacular debut performance against Pakistan at Hagley Oval. The Auckland allrounder took six for 41 from 15.5 overs to rip through Pakistan and dismiss them for 133 shortly before tea, after New Zealand had won the toss. He is the eighth bowler to take five or more wickets on debut, and his are the best figures of them all. De Grandhomme, born in Harare clearly outshone everybody. Talking about debutants, Indians would never forget Narendra Hirwani and the tall lanky player from Dombivili, Nilesh Kulkarni, who played his last test at Chepauk. Remember him ? I am really surprised to read this report in MailOnline which dismisses England on day 2 itself. Indians made 455 with Ravi Ashwin and debutant Jayant Yadav having a long partnership. The report reads : ‘England crumbled against spin once more and end day two on 103-5’ – and asks whether England can save this test at all ? ~ : If Rajkot shielded England from the realities of India, Visakhapatnam has mercilessly exposed them. At 103 for five on the second evening of this Test, they trail the Indians by 352, and need a miracle to avoid going 1-0 down ahead of next week's third Test in Mohali. It was the kind of session that England fans feared in advance of this trip, and the kind of session that many a touring team have experienced in India over the last couple of years. These things happen, and they will happen again before the series is over. This pitch is already showing alarming signs of uneven bounce, not to mention sharp turn. It could have been worse but for that large slice of luck that Ben Stokes enjoyed - he missed the flight of Jayant Yadav, the ball brushed the off bail without dislodging it. The debutant Yadav was summoned to the bowling crease in the 33rd over, he was under no pressure whatsoever. His first over was largely uneventful, but with the second ball of his second over, he defeated Moeen Ali’s dance down the track and struck him on his pad. 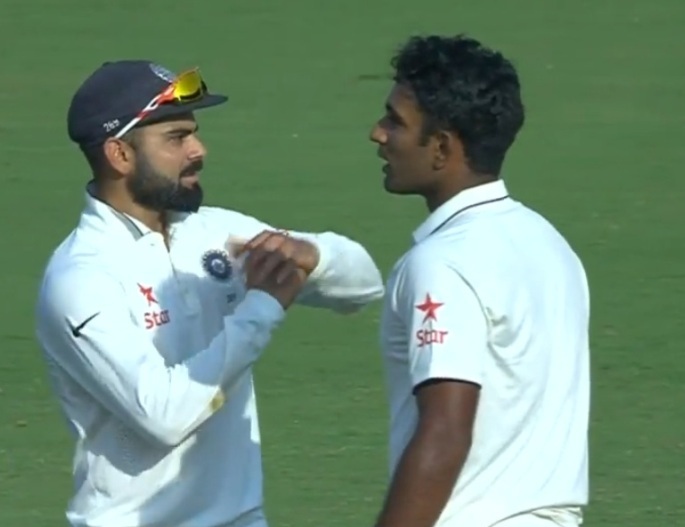 Jayant was convinced the ball would have gone to hit the stumps had the pad not come in the way, though it was ultimately Saha who had been standing behind the stumps who convinced Kohli to go for the review. The review proved Jayant and Saha right, and Kumar Dharmasena, who had originally negated the leg-before shout, wrong. First Test wicket in the bag with the help of technology that India has shunned all along. Certainly a good day for the Haryana off-spinner who became the 286th cricketer to play Test cricket for India. The 26-year-old hit 35 to help the hosts to a total of 455 before running out Haseeb Hammed with a great pick up throw – Saha collected and sort of emulated Dhoni is shying at the stumps without seeing it. Fifty-six bowlers have taken a wicket with the very first ball they bowled in one of the three formats of international cricket. Twenty bowlers have performed this feat in Test cricket. There is only one Indian – Nilesh Kulkarni. In One dayers, rather surprisingly, it is Sadagopan Ramesh. Nilesh Moreshwar Kulkarni, the tall bowler came on to bowl in Test 1374 at Colombo in 1977 after India made huge 537/8 decl. Off his first delivery, he had Maravan Atapattu caught behind by Mongia - but cruel fate was to follow. Lankans went on to make the highest in Test Cricket 952/6 with Sanath Jayasuriya making 340; Roshan Mahanama 225, Arvinda Desilva 126 and Nilesh’s figures in the end read 70-12-195-1. The others had worser figures : Anil Kumble 72-7-223-1 and Rajesh Chauhan 78-8-276-1. He ended up playing only 3 tests. In all he bowled 738 balls, gave away 332 runs and could add just one more to that of Atapattu. He last played for India in Test no. 1539 at Chepauk where India beat Australia by 2 wickets in March 2001. He scalped the dangerous Mathew Hayden in the second essay. In that Pongal Test at Chepauk in 1988, India led by Ravi Shastri (his only Test as Captain) had 3 debutants : WV Raman, Ajay Sharma and Hiru. Phil Simmons debuted for Windies. Hirwani took three of the five West Indian wickets to fall on the second day. On the third morning, Hirwani clean-bowled Vivian Richards with a googly went on to finish at 8 for 61; in the Second against a huge target of 416, Vivian Richard’s WI were dismissed in 40 overs. Hirwani was the wrecker-in-chief again with 8 for 75 and overall match figures of 16 for 136. Though he started in the most exciting manner equalling Massie- an Australian - Robert Arnold Lockyer Massie despite that huge success in debut played in 6 Tests and 3 ODIs from 1972 to 1973. He took 16/137 at Lords. Hiru too could not match his great opening – some said he was too slow in the air to cause trouble, except on wickets which turned sharply. Read that Jayant Yadav lost his mother Lakshmi, an air hostess, to a plane crash near Aurangabad some 17 years ago.